What meat lover doesn't LOVE bacon? Mmmmm. Any dish can be improved with a little bacon (just ask donut shops!!) However, I’m hyper-aware that it’s not one of nature’s healthiest foods. As a result, I save my intake to a few favorite recipes (my grandma's Mac & Cheese, Broccoli Salad, and the rare BLAT sandwich). Still, I was super excited to see bacon on the new Creative Loafing list this year. If I was list sampling, I was OBLIGED to sample away. The only problem was the location of the store. The entrance is from Pine Street Market, a butcher shop in Avondale Estates, which isn’t close to me. Fortunately, one of my friends mentioned that Pine Street Market is a regular at the Sandy Springs and Peachtree Road Farmers Markets. 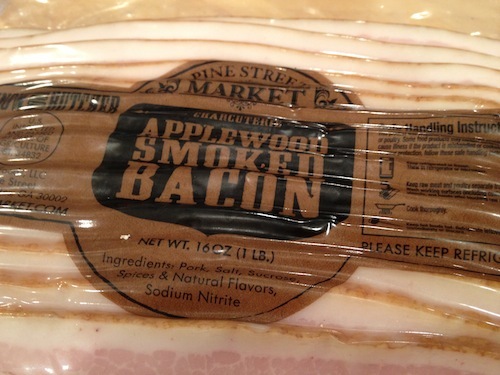 I hustled over last week and scored me a pound of bacon.Not only is it list worthy, I’m now concerned that I have a new obsession: Applewood Smoked Bacon. Rarely have I tasted such a clear infusion of the sweet Applewood on meat. So tasty! Absolutely worth hunting down. Also, in case you don’t know about the easiest way to cook your bacon, here’s a quick primer. Begin by preheating your oven to 400 (for thin or regular sliced bacon) or 375 (for thicker cut). 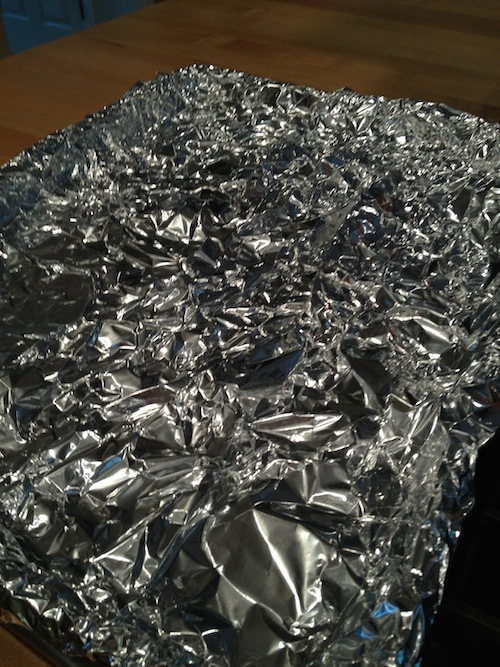 Pull foil longer than a deep rimmed baking sheet.Crumble foil and secure to the baking sheet. This allows a place to go for the fat from the bacon!Place bacon on the foil close, but without touching.Bake for 15-20 minutes. You may need to rotate the bacon halfway through to prevent burning due to hot spots. (I took a shower while this batch was baking so I missed the turn, but that’s another benefit of baking bacon – it doesn’t need constant supervision! )Dab off excess grease and serve with your favorite version of fried eggs or eat plain!Enjoy! !